See Serious Eats review of this cookbook with sample recipes for Barbecue jalapeño poppers and Simple perfect chili. This book was listed in their Best Cookbooks of 2009. See Recipe Girl's review of this book and her take on Beans and cornbread with the recipe. Try the prune cake! It's so moist and it keeps for days. My boyfriend and I made the chili the other night. It was fantastic! I can't wait to use this cookbook again. Add diced ham, carmelized sauted onions and red pepper. Use cheese combo like fontina, gruyere, cheddar (small amt - doesn't melt real well) other white melting cheeses. Used combo of whole cream and whole milk. Yum. Go-to mac & cheese recipe for me! Simple and basic, but is a staple recipe at my house. This dish was a bit heavy on the breading and oil. Meat was tasty, but was it healthy??? This is a favorite recipe, and beloved my the males that have had the pleasure to eat the sandwich. I would make these again. My husband adores this ... if I ask him what he wants to eat this comes very high on his priority list!! The bonus is it's easy and quick to make. I have to admit I have never cooked cube steak before but this sandwich will make me rethink this cut of meat. The family loved this sandwich! Easy to make, simple cake that is moist and delicious. Love the nuts in the frosting. This couldn't be simpler. I love fried bread and I love eggs, so this is a perfect quick cooked breakfast for me. I was really excited about getting the Pioneer Woman book and this was the first (and so far, only) recipe I tried. Unfortunately I found this to be very disappointing. Good meatloaf is one of my favourite comfort foods, but this version uses bread and milk as binders for the loaf and when I made it, it came out way too soggy and wet for my liking. I've concluded that I much prefer using dried breadcrumbs and eggs. I also don't think baking it on a grill as suggested is the best idea as it makes it incredibly hard to slice and serve. This was simple and straightforward to make and overall I quite liked it. I'd never eaten clams before so I thought I'd give it a go, even if they were only from a tin. The sauce was nice and creamy and the texture of the clams with the freshness of the parsley went very well with the linguine. It was a nice Saturday night meal with a glass of wine. My only complaint was that the clams didn't have a very strong flavour, so aside from the texture they gave the sauce, which I liked, they didn't add very much to the dish. Maybe a stronger, bolder seafood in here would be better. Still, not too bad at all. This is now my go to lasagna recipe - it held its shape when cut, tasted delicious and froze nicely. Go-to lasagna dish for me! Only differences is that I use a combo of ground beef & Italian sausage (usually 1# of each) & replace the cottage cheese with ricotta cheese. I also use the non-boil lasagna noodles. Turns out great, I freeze this one too & it turns out great. This pizza crust is great, the texture is a little more chewy then usual, but I like it. The recipe always works for me, which is very important. I double this & freeze one for future use. Easy & consistent pizza dough recipe. One of my favorite recipes from the book. My family loves this and so easy to make. This is a great way to make cheesy potatoes without the expense of pricey cheese. The family loved this one. Family favorite, this recipe makes a ton of cinnamon rolls! Great for freezing. I freeze before the last rise. When defrosting, I let it defrost overnight in the fridge, then will let it come to room temp and let it rise while the oven is heating up. Then you can bake for hot fresh cinnamon rolls whenever you like! Good chili recipe, this recipe has become my base chili recipe and I am constantly changing and tweaking it, but it is a great starting place. I have also replaced the ground beef for other ground meats like turkey or chicken on occasion, it is still just as delicious. I urge you to buy this book... Then I dare you to resist cooking something from it. While this chili was super easy to make, it wasn’t… very tasty. The end result was more like something you would pour over a chili cheese dog instead of a stand-alone dish. It has all my favorite things in it: crunchy bread, gooey cheese, and briney olives. See why my bathrobe is tight? My name is Ree. I'm a desperate housewife. I live in the country. I channel Lucille Ball, Scarlett O'Hara, and Ethel Merman. Welcome to my frontier! Paula Deen meets Erma Bombeck in this spirited, homespun cookbook, which colorfully traces one woman's transition from city life to ranch wife through recipes, photos, and pithy commentary based on the author's popular, award-winning blog. The Pioneer Woman Cooks takes readers on a voyeuristic journey through the life of a girl who once believed a Grande Latte from Starbucks was the key to all happiness but who ultimately finds her bliss in the arms of a cattle rancher. Breaking free from a dead-end relationship, Ree Drummond left Los Angeles and made a pit stop at home in Oklahoma on the way to a new life in Chicago. It was there she met "Marlboro Man," a fourth-generation cattle rancher with steely blue eyes and a muscular work-honed body. Drummond fell hard and fast, and suddenly she was married, living on his ranch in the middle of nowhere, and managing a brood of four young children (also known as "ranch hands"). In her folksy, wonderfully engaging voice, Drummond shares how she learned to cope with the isolation and peculiarities of ranch life, from chasing beavers out of the pond and saddling horses, to cooking for a man who believes the sun rises and sets in a steak and baked potato. Using only simple and widely available ingredients, Drummond shares many of her satisfying and delicious recipes--both for cowboys and cowgirls--including Cowboy Calzones, Pioneer Woman's Ribeye Steaks, Cheese Grits, fresh Blackberry Cobbler, Pico de Gallo, and Iny's Prune Cake. 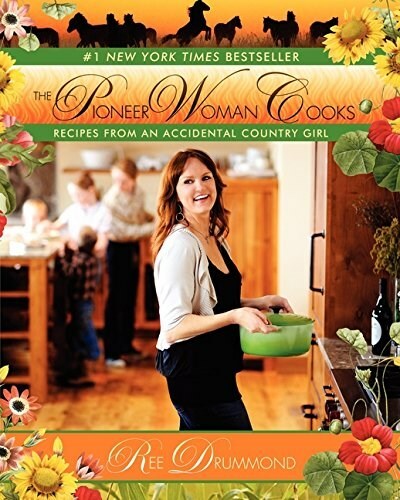 Bursting with the colors and flavors of country life and peppered with her wonderful homespun stories, The Pioneer Woman Cooks encourages even the most harried urban cook to slow down, relish the joys of family, nature, and great food, and keep it real.